SAN FRANCISCO–(BUSINESS WIRE)–Clear Channel Outdoor (CCO) (NYSE: CCO), a subsidiary of iHeartMedia Inc., today announced the launch of two new digital media networks, totaling 100 dynamic IP addressable HD screens in the highly-sought after urban metro area of San Francisco, Calif. CCO will fuse the new “Digital Urban Panel” networks into its Clear Channel Outdoor RADAR campaign planning and attribution solutions by Feb 2018, becoming the first street-level media capable of reaching audience groups based on their consumer travel patterns and behaviors derived from mobile data. 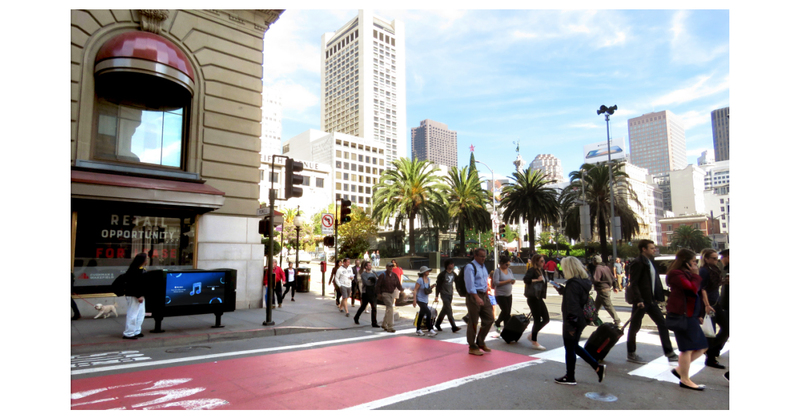 The roll-out of these HD digital screens, in prime locations throughout San Francisco, converts traditional media into highly valuable, dynamic digital inventory that allows brands to engage with residents and tourists using state of the art digital technology. All 100 Digital Urban Panels on pre-existing street-level news racks throughout the city are IP addressable and offer dynamic and real-time content capabilities. The first 50 screen digital network went live Nov. 20. The second, 50 screen digital network, will be complete the first quarter of 2018. These new assets allow brands to engage with audiences on a digital Out-of-Home (OOH) product with wide frequency and depth of coverage. Further, when coupled with CCO’s existing transit shelter media in the market, brands can increase their media weight and presence through takeover opportunities that offer 100 percent share of voice. In parallel with this 100-unit strong advanced advertising deployment, CCO will integrate all its OOH pedestrian-level printed and digital screens in San Francisco, and throughout the U.S., into Clear Channel Outdoor RADAR. This includes bus shelters, stationary transit media and highly-populated transit hubs. This advanced advertising solution answers a call from brands looking to improve the effectiveness of their campaigns, enabling them to choose from among 700 different audience segments incorporated into the CCO RADAR solution. It also allows advertisers to measure the impact of their OOH campaigns, which have been shown to help brands achieve double to triple digit lifts in visits to advertised retail locations. With locations in Union Square, the Financial District, Moscone Center, AT&T Park and Market Street, Fisherman’s and the Embarcadero, the new Digital Urban Panel networks reach highly-desired consumer audiences in the most densely populated districts in the San Francisco metropolitan region in non-residential areas, the company is seeing interest from clients in telecommunication, spirits, fashion and tourism. Union Square: The digital network greets tourists and shoppers visiting the area and many who huddle each day to view one of the city’s most unique sites, the manual cable car turnaround. Characteristics of the area include: Shopping, tourists, nightlife and dining. Financial District: Digital panels illuminate this electrifying area, often filled with early morning cappuccino drinkers at cafes or late-night cocktail sippers at well-appointed lounges. Characteristics of the area include: Business, banking/financial, entertainment and dining. Moscone Center: Located in the heart of San Francisco, with digital panels on all sides, Moscone Center is walking distance away from downtown hotels, world-class dining and some of the city’s best shopping. Characteristics of the area include: Conventions/events, business decision makers, entertainment and dining. AT&T Park: Digital panels stand amidst the trendy restaurants surrounding AT&T Park catering to residents, visitors and the over 40,000 Giants fans who attend home games each season. Characteristics of the area include: Sports, outdoor events, family entertainment and dining. Market Street: A major thoroughfare in San Francisco, restaurants, banks, QSR’s, corporations and retail stores such as The Apple Store, Adidas, The Gap, Levi’s and the Westfield Shopping Center blend with the digital urban panels for a multi-block stretch. Characteristics of the area include: Business, banking, entertainment and dining. James has over six years experience as a teacher, ecologist, zoologist and botanist. He taught (HS) Physics, Geology, Oceanography, Chemistry and photography from 1970-1980 at Palfrey Street School, Watertown, MA. Aproject: National Cooperative Highway Research Program.